The Amerock H55465AS Pilltop Coat and Hat Hook is finished in Antique Silver. Single hooks are most versatile and can be mounted into wood surfaces and drywall. Antique Silver is a sleek and lush finish with deep, rich colors designed to compliment traditional, transitional and eclectic styled homes. Command Traditional Decorative Hooks come in a variety of sophisticated and playful styles, giving you endless options for every room and person in your home. Command Damage-Free Hanging Hooks hold strongly on a variety of surfaces, including paint, wood, tile and more. When you are ready to remove your Command Hook, it comes off cleanly without damaging surfaces with holes, marks, sticky residue or stains. Re-hanging the Command Hooks is as easy as applying a Command Refill Strip, so you can reuse them again and again! This Command Decorative Hook holds up to five pounds. This pack contains one hook and two strips. From Liberty Hardware, this 10 inch Scroll hook rail/rack is one of our most popular options. It's ideally suited to hold a variety of items like coats, hats, handbags, umbrellas, towels or robes. 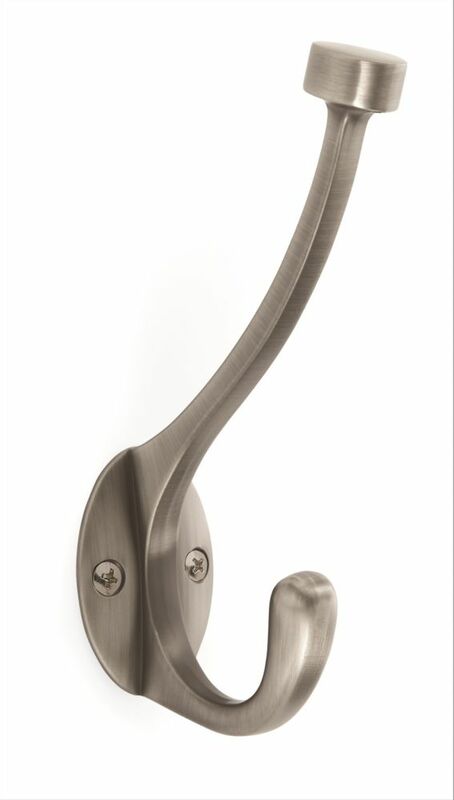 And with the 3 scroll hooks, reminiscent of iron work, it's a beautiful addition to any room. From Liberty Hardware, this 27 inch Scroll hook rail/rack is one of our most popular options. It's ideally suited to hold a variety of items like coats, hats, handbags, umbrellas, towels or robes. And with the 6 scroll hooks, reminiscent of iron work, it's a beautiful addition to any room. Pilltop Coat and Hat Hook - Antique Silver The Amerock H55465AS Pilltop Coat and Hat Hook is finished in Antique Silver. Single hooks are most versatile and can be mounted into wood surfaces and drywall. Antique Silver is a sleek and lush finish with deep, rich colors designed to compliment traditional, transitional and eclectic styled homes.